There are a few recipes using Curry Leaves posted by me earlier. 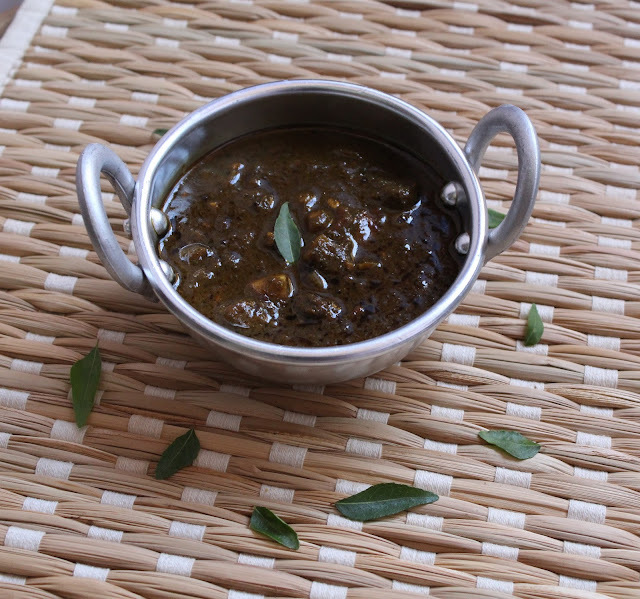 In that Series, Curry Leaves Kuzhambu is a very tasty and also unique recipe. It can be used for two-three days especially as a sidedish for curd rice. 1. 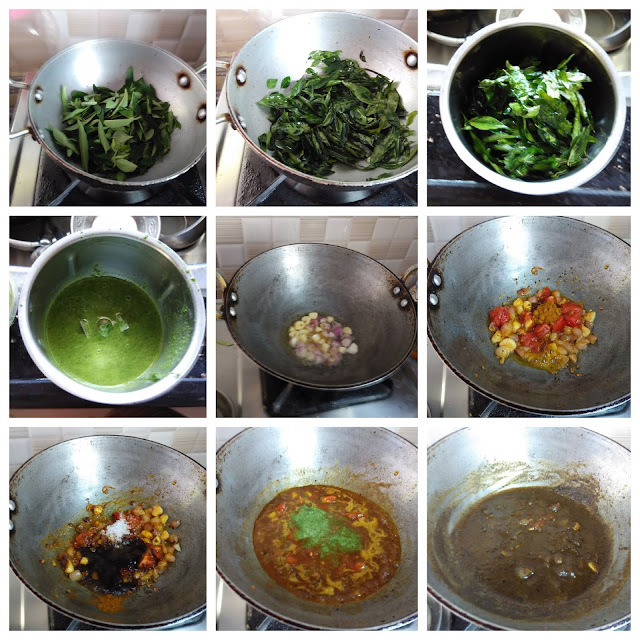 Heat 1 tsp of oil in a pan, add curry leaves and fry till the color of the curry leaves become changed. Allow it to cool down completely. 2. Then grind them into a fine paste with little water using the mixie jar. 3. Heat 2 tbsp of oil in the same pan, add mustard seeds and wait for popping. 4. Add cumin seeds and fenugreek seeds, wait for splutter. 5. Then add onion and garlic pods. Fry them till they become translucent. 6. Add chopped tomato and fry till they become mushy. 7. Now add sambar powder, turmeric powder and salt. Fry for few seconds. 8. Extract the juice from the tamarind using ½ cup of water. 9. Now pour this tamarind juice with above mixture ( from 7) and mix them well. Close the lid of the pan. 10. Allow it to cook till the raw smell of the tamarind goes off. 11. Now add the ground curry leaves paste (from 2) and mix them well. Cook till the kuzhambu becomes thick. Healthy and tasty curry leaves / karuveppilai kuzhambu is ready. 1. Increase or decrease the curry leaves quantity according to your taste. 2. Adjust the sambar powder level according to your spice level.